If you're looking to travel like a VIP accross the River Thames look no further. Our private hire service allows you and your guests to enjoy the bright lights of London city centre whilst leaving all the hard work up to our highly trained staff. We can arrange the catering, drinks and service, as well as music and entertainment, decorations, or anything else you may require. 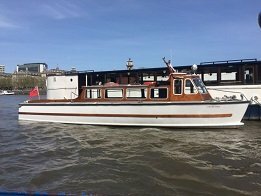 Our private hire on the River Thames Cruises are perfect for travelling accross London in style, simply let us know your requirements and we can suggest the perfect private London hire boat. We can accomodate up to 250 guests on our private hire cruises so are well equiped for wedding parties or conference transfers. Our team are dedicated to making your function an occasion to remember. Working tirelessly behind the scenes, we will ensure your event runs smoothly whether it’s a private corporate dinner or a wedding reception. We offer a wide range of finishing touches to add a personal feel to your event no matter what the occasion. For more information please get in cintact with our team on info@riverthamescruises.co.uk or through the contact form below. o make a booking please Contact us on our 24 hour call answering service on 020 7237 9111 alternatively, simply fill in the form below and press send and we will get back to you shortly regarding your enquiry.